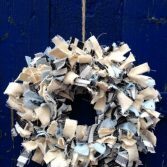 Winter wreaths are the perfect mixture of warm fabrics and swatches of fabric you have laying around from old clothes, blankets, etc.. Transform a slow, cold evening into something productive by making a winter wreath from some useless rag scraps. 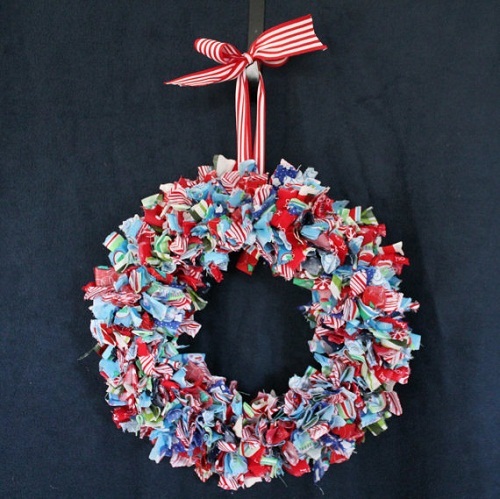 You’ll be surprised to see how some odd bits of cotton can be transformed into a cute rag wreath. 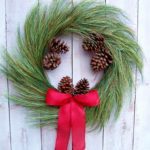 Easy winter wreaths for your mantel or front door. 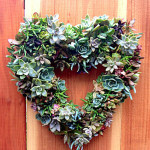 Link to How to Make a Rag Wreath video, here. 2 yards of fabric or fabric scraps – Save money and use remnant fabric found here! Make approximately 330 (or less with larger fabric strips) fabric strips of 8″ each from the 2 yards of fabric. If you don’t have time to cut strips you can buy pre-cut fabric strips here. You can either cut or tear the strips across the fabric. 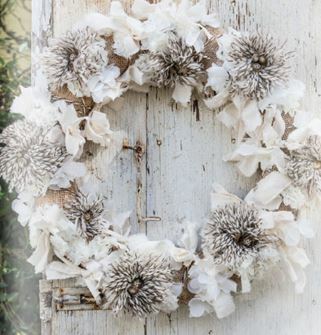 Tearing up the strips will create frayed edges, giving the finished wreath a rustic look. Just tear the strips across the fabric and cut them later into 8″ pieces with the scissors. Place a strip behind the outer two wires of the form and tie a knot. Place another strip behind the two middle wires and tie another knot just like the first one. Now, tie a third knot with a strip around the inner two wires. Now, repeat the whole process of placing the strips and tying knots the way described in the previous step. Don’t mess up with the order of wires to be knotted. Keep placing strips behind two wires at a time and tying knots all the way around the form until the entire wreath is filled. Push the strips occasionally together after tying a couple of knots. 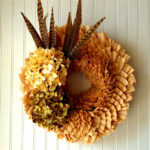 It will leave no visible blank space and make the wreath look fuller. If you can follow this pattern of tying knots, the back of the wreath will look like a knitted surface. Choose the fabrics in the color and patterns that compliment the décor or color palette of your home. 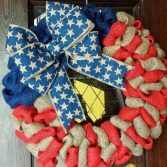 It will not take long to finish the rag wreath. 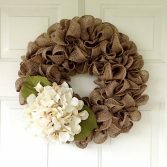 Start doing it while watching your favorite movie and the wreath will be complete before the movie is even finished! 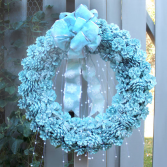 The fabric made winter wreath will be a perfect adornment to hang on your front door during this winter. 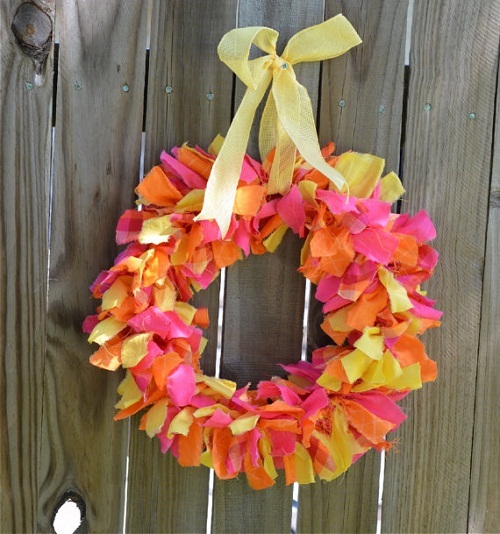 The cold weather won’t do much harm to it while the bright and cheery rag wreath can give a warm welcome to everyone knocking your door! Do you have a local Joanne store near you? 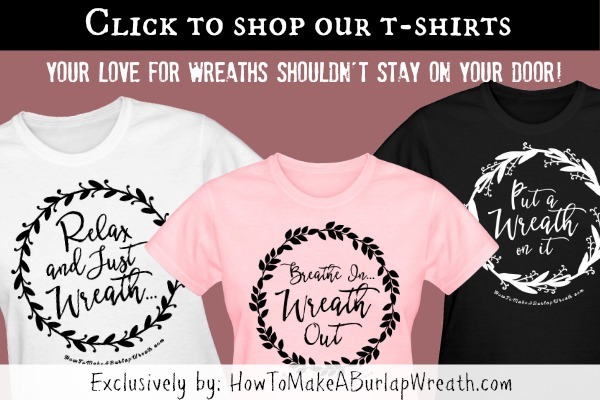 They offer instructions to make a winter rag wreath here. 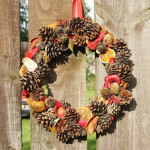 For more all occasion wreaths see our All Year Around wreath category. Absolutely fabulous. Love it and I think I could actually do this myself. Wooo hooo! Thanks for posting.